Looking for a trusted pharmacy Cork? 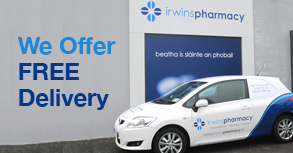 Irwin’s Pharmacy Group consists of three suburban and city centre pharmacies in Cork, our Shandon Street pharmacy is a late night Cork city pharmacy, our Mayfield pharmacy serve the northside of the city and our Togher Pharmacy serves the southside. Since our first Cork chemist shop opened in 1996, we have provided our customers with the best in pharmacy healthcare and advice. Our emphasis on staff training and customer service has ensured a strong patient care focus across our pharmacies in Cork. As part of our dedication to our customer well-being, we provide a late night pharmacy in Cork city, which is open until midnight, seven days a week, at our Cork city centre pharmacy on Shandon Street.